As children and young people, we often look to those we admire as guiding stars on the journey to become ourselves. Bob Dylan found that star in Woody Guthrie, changing his life and modern music history. 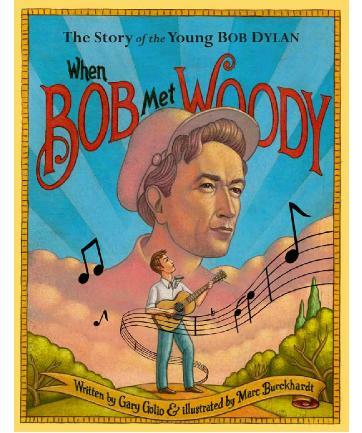 When Bob Met Woody is about Bob's early years in Minnesota, his passion for rock and roll, country, and blues, and his discovery of folk music greats like Leadbelly. Hearing Odetta's fiery ballads, he traded in his electric guitar for an acoustic, and began playing in Minneapolis coffeehouses. When a friend turned him on to the songs and singing of Woody Guthrie, Bob felt like he'd found a home. Learning that Woody was still alive in a New Jersey hospital, he traveled east during a January snowstorm and soon made his way to Woody's side. With his first step onto a Greenwich Village stage and the writing of his "Song to Woody," Bob was on his way! "Golio produces another sensitively written, meticulously researched picture biography, this time capturing the intense ambition of the young Bob Dylan." "Golio excels at portraying Zimmerman's angst as he flounders for meaning and even invents for himself a more colorful backstory. ...Back matter, including quotation sources, is superb. A stirring introduction to two music legends." "lyrical, plainspoken writing that echoes folk music itself"
Read the NY Times Book Review, by Dylan scholar and author Sean Wilentz! Listen to an interview with BOB author Gary Golio, conducted by Markus Goldman, maestro dj of Philly's great rock station, WMMR!